Raymond Gubbay and the Royal Albert Hall present English National Ballet at the Royal Albert Hall in June with Derek Deane’s lavish in-the-round production of Swan Lake – the largest production of its kind in the world and London’s dance event of the summer. This will be the sixth sensational season in which this ballet has been performed in-the-round. Featuring more than 120 dancers on stage, this production has delighted audiences around the world and has been seen by nearly 500,000 people since its premiere in May 1997. Derek Deane’s staging of Swan Lake has proved to be a phenomenon and offers audiences a spectacular theatrical experience. 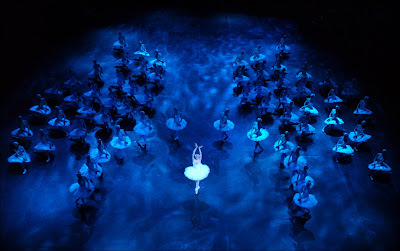 Rows of swans move in unison across the stage and the athleticism of the dancers is tested to the full in this spectacular production. Set to Tchaikovsky’s classic score, played by an orchestra of more than 80 musicians, this magnificent production features acrobats, jugglers and 60 swans gliding across the arena within the magical splendour of the Royal Albert Hall. The dramatic narrative of Prince Siegfried’s fight for the love of the queen of the swans, Odette is told through sumptuous costume designs and choreography that uses the space to great effect. Set design is by Peter Farmer and lighting by Howard Harrison. Bolshoi trained prima ballerina Polina Semionova will dance the opening night of Swan Lake in-the-round as Odette/Odile, partnered by English National Ballet’s most exciting young talent Vadim Muntagirov as Prince Siegfried. 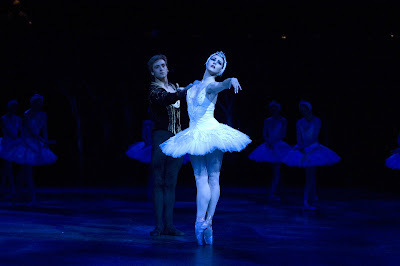 A Principal Dancer with Berlin State Opera, Polina first performed with English National Ballet when she was 19 in Swan Lake in-the-round in 2003. She has since gone on to become one of the world’s most sought after ballerinas performing around the world with partners including Roberto Bolle and Igor Zelensky. Vadim Muntagirov is one ballet’s hottest young talents; he joined English National Ballet from the Royal Ballet School in 2009 and is already being hailed as a star in the making. Vadim will also dance with English National Ballet’s Senior Principal dancer Daria Klimentová during the season. The lead roles at other performances will be performed by the English National Ballet’s Principal Pairings; Daria Klimentová and Vadim Muntagirov, Erina Takahashi and Dmitri Gruzdyev, Elena Glurdjidze and Arionel Vargas, and Begoña Cao and Esteban Berlanga. English National Ballet is delighted to be performing this classic production in its 60th Anniversary year. The production represents many of the Company’s key values, taking classical ballet of the highest quality to the widest possible audience, at a price everyone can afford. yes absoloutly amazing and thanks for sharing and posting . So gorgeous. I love these images. We just don't get to see this in Vancouver....well, on the rare occasion. aw i've seen swan lake in the past seven months siz times. Anyone on here a ballet dancer? Inspiration in Italy - it's quite a spectacle ! Couture Cookie - I think you should - would be great to catch up with you too ! KIRAFASHION - that's great to hear ! You are in the right place ! Pinecone Camp - maybe worth a trip to the UK for a summer holiday ? courtneybobby - thank you - and welcome !